That stands for "Blow it up yourself" by the way, hence, these pages are for the slightly skilled who need a bit of a hint as to what goes on inside,.. particularly when it's not quite sounding right! Also in here will be a few "inspirational" insights into the real world of music electronics. I really must clear up something here that seems to be some sort of popular myth. A good computer engineer will work wonders with your computer but that doesn't make them a sound engineer. A good electronic engineer, even with a master's degree, doesn't make them a good sound engineer. A good sound engineer has a knack of getting the best sound out of a piece of audio kit because he has a good pair of ears BUT that doesn't mean he can pull it apart and fix it. I have found very few electricians who really understand what goes on in electronic kit,.. and the reverse also applies!! I have, believe it or not, seen a mains plug wired completely, lethally wrong by an electronic engineer with a bloody degree! If you want to use all of this techno stuff AND understand how it all works, be prepared to spend a lot of time (and money) studying the theory of electronics, accoustics, computers, music and then do a fair bit on psychology as you realise that sound is subjective and nothing in this business is anything more or less than art in the purest form, at the cutting edge of technology! You must also learn and completely understand electrical wiring. Musical equipment is usually connected to the mains and then often metal parts (mics, strings,) are also connected to real live people so keeping them alive means keeping the electric bits SAFE!! A lot of musicians have been electrocuted on stage,.. every single incident was a stupid, ignorant mistake. Me? I started in this business as a busker, I made my first guitar and thanks to Clive Sinclair, a battery powered amp to go with it out of pure neccessity (my Dad wouldn't buy me one). Then I spent years studying all kinds of stuff and have now found that I'm still a busker,... and a very eccentric one at that! THIS IS NOT INTENDED AS ANY SORT OF TRAINING SO DON'T ASSUME ANYTHING HERE IS ANYTHING MORE THAN IDLE CHAT. IF IT WORKS,... THAT'S A BONUS!! In spite of all the high technology available these days, in the form of computer based audio systems; there are still those boring old gits who insist that a glass tube with a strange collection of bits of metal inside, and all the air sucked out, still makes a better sound than the latest transistor amplifiers. Of course anyone who has "studied" electronics knows that these old valve circuits have not even a hope of getting the "signal-to-noise ratio" that state of the art kit can achieve. That is of course quite true but to be honest, that also is a bit misleading as I don't know of a single course syllabus that actually covers valve circuits and very few tutors even mention them in passing! So why is it that guitarists will pay double the price for a monster tower of amps and cabs with valves? Why would a top studio want a valve microphone pre-amp or compressor to feed that really expensive mic into and not just the latest super microprocessor controlled digital jobby? Does the "warm sound" have anything to do with the fact that these fragile glass components will take your skin off if you handle them and can chuck out more Watts in heat than sound level? This is the music business here mate,... nothing is supposed to make sense is it? How can we get a "pure" note out of such old noisy kit? Well that depends on what you call pure I guess. It's all very well sitting down with a digital editing suite and cleaning up the wavs till they have notes, pure notes and nothing but the notes,.... but have you really improved the sound by doing so, or have you lost something? Theoretical audio is always evolving but the human ear is still the same bit of skin and gristle it always was, so can we really teach such an old bit of kit new tricks? No,.. and to make matters worse, the human ear is not nearly a linear device as far as audio pick-ups go and added to that, it is connected to a very individual filter called the human brain and any guy who has met more than one woman will tell you the brain is not a stable filter at all! It is possible to fool the ear and the brain into where a sound is coming from in space, but most ears will be able to tell the difference between live and studio recordings, depending on how many rock concerts they've been subjected to! The ear is an amazing device all on its own but when you consider the added selective effect that the brain adds to what it "hears", then no other system of audio pick-up can even approach its quality, or its eccentricities. I still have my collection of vinyl records and no matter how pristine the new CD might be, there is something about the hiss, crackle and other spurious noises that make them special to me. It really has nothing to do with sound "quality" in the theoretical sense. It has far more to do with the fact that when I first listened to these classics like "Stairway to Heaven", it was on a really cheap and nasty mono BUSH record player cos that's all I could afford thus, the hiss crackle and distortion became a part of the audio experience. Perfect it wasn't but it was, at a mere twelve watts, loud enough to upset the neighbours,.... frequently! More to the point, it was the music I was listening to, not the sound quality. Yes I do have amps now that are silent till driven, put your head in the bins and the first note will make your nose bleed! I also have some really nice digital instruments but there is something about a sound that is less than clinical,.. it is closer to what I hear in the real world. That is where old valve technology scores so heavily, it does distort but when it does so, it actually produces harmonics that are related to the musical scales we play, or listen to so it tends to add something that fits rather than sticking out like a sore thumb. 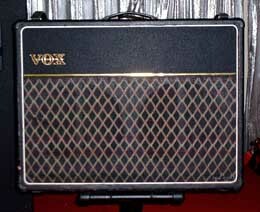 This is the reason that an old VOX AC30 can sound louder than some modern 100 watt amps, it's that the overdriven valve produces a unique addition to the sound of a guitar that is very hard to accurately "emulate" with any solid state device. The sound Brian May gets out of a wall of these antiques is ample testament to that, quite apart from his own unique talent for making one note do more than most guitarists do with several! The HAMMOND sound was born in valve state entirely, the little click that accentuated the notes was a function of the high voltages and not a designed in effect. Again, the classic "Whiter Shade of Pale" was done with a Hammond M100 series and nothing quite gets the same feeling, because it also had the same characteristic sound as the amp heads the rest of the band were using. The overall mix was thus producing the same "tuneful" harmonics, giving a wall of noise that was acceptable to the musical ear. Two other more technical quirks to add to this is to do with the actual voltages that these two technologies operate at. Solid state pre-amp devices have power supply rails that are quite low, anything from 3 to maybe 30 volts. These voltages are very flat and regulated. If you drive a signal till it manages to reach the supply rail, the top of the signal gets very flat with very sharp edges (square waves). This has the effect of severe distortion and masses of harmonics, overdriving digital recorders shows this up real quick! Valve circuits on the other hand have voltages that are above 100 volts and the smoothing is not as acute. The point at which a signal "hits" the anode voltage is softened by the resistor feeding it and that resistor, with the smoothing capacitor, creates a low frequency "time-constant" which tends to round off the edge of the resulting 'distorted' signal, thus the imperfection is not so jagged on the ear. HH in the UK, made a module for their solid-state amps that consisted of a series of such filters to get close to a valve sound. Rocket science it ain't but it was close, not close enough to put Jim Marshall out of business though! HH is gone, Jim is still very much in business,.. kinda says a lot. Ah yes,.. I mentioned heat in passing didn't I? Interesting thing about noise from solid state stuff is that the figures they give you only apply to "bench" conditions usually, which means as soon as the thing gets hot in the rack you crammed it into, the noise gets worse because most components get noisy when hot. Solid state will die around 50 degrees C, unless it's military spec and you won't find much music kit built with such high spec., expensive devices, if any. Valves on the other hand, are designed to work hot, hence getting a bit warm in the rack aint gonna make the slightest difference is it? I remember a rack of HI-WATT PA amps that were all valves, you could (and we did) fry breakfast on the top of them! Heat will not kill your valve amp, it will still be just the same as when it quit QA,.. unless you fiddled with it! A hot stage can and frequently does literally send solid-state gear up in smoke. And one final point,... stupid I know but if the worst was to happen and some idiot actually did "push the button" to wipe out the world as we know it,... all your super-conductors and high-tech semiconductors will be dead with the first bang. Valves (and beetles apparently) will survive, so at least rock music will live on,... even if we don't? WHAT DOES A PICKUP PICKUP? WHAT MAKES AN OLD ORGAN COME TO LIFE? NEW LIVES FOR OLD LESLIES! If you are into building stuff from scratch, try ESP!! This site is really useful,..